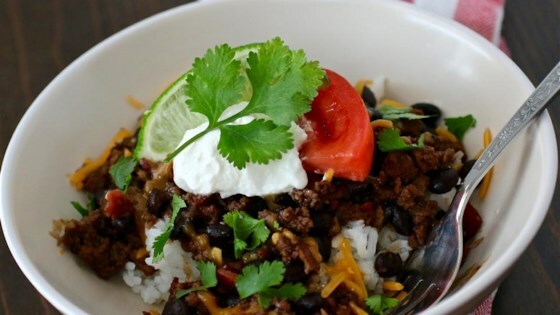 "Delicious black beans pureed and combined with chorizo, onions, and a hint of garlic. Perfect as an enchilada filler or as a side dish." Pulse chorizo, onion, and garlic together in a food processor until well-chopped. Place bacon in a pot and cook over medium-high heat, turning occasionally, until bacon starts to render fat, 3 to 5 minutes. Add ground chorizo mixture to bacon; cook and stir until onion softens and is translucent, about 5 minutes. Drain excess fat from pot and season mixture with cumin, salt, and black pepper. Stir beans and reserved liquid into pot; cook, stirring occasionally, until beans are heated through and flavors combine, 10 to 20 minutes. This is good. I made this for homemade burrito bowls and it was perfect.